Is your dog scared when put on the exam table at the veterinarian? Since I believe fear has no place in a vet clinic, I’ve been working to make visits Fear-Free for pets. Some of the tricks I’ve learned to turn up the happy and turn down the sad are easy and free, and some require a small investment from your veterinarian. For dealing with exam table blues, I’ve got a little bit of both! First, meet Beau and Lela, who I saw at North Idaho Animal Hospital. Beau is a 9-year-old Beagle and Lela is a 5-year-old Lab, both amazingly at close to an ideal body weight — not something I often see in those breeds, and believe me, I let their people, Bobbie and Steven, know what a great job they’re doing! I also made sure both dogs were comfortable before I examined them. For large dogs and those who are afraid of the table, getting right down on the floor with them is an easy and free way to make sure a complete exam is done without stress or fear. If the pet really needs to be seen on a table, the veterinary team and owner can work together to teach the dog that good things happen — usually in the form of treats — when they’re on the table. 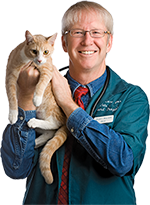 What have you and your veterinarian tried to reduce your pet’s fear of the exam table?